WREAK HAVOC PRODUCTIONS, LLC is a small, independent film production company owned and operated by filmmakers Dan Sellers and Sammie Cassell. While this production company is a hobby, the goal is to turn it into a thriving business by producing quality short and feature-length films, and other creative endeavors. So far we've produced and released feature films and shorts, and have several films in various stages of production. Also, we host two podcasts and manage an international horror film festival. This production company is based out of Greensboro, North Carolina. Dan Sellers began making films in 2013 with the horror-comedy Hank vs. The Undead. Hank was originally intended to be a short film, an exercise in filmmaking, just for the fun of it. However, as production got underway, a bigger story presented itself and the scope of the film was broadened. Dan was tasked with handling many of the basics of filmmaking by himself; from writing the script, to casting and scouting locations. He even researched cheap and practical special effects and built apparatuses used in making the film. Before Wreak Havoc Productions was established, Dan and his wife Lauren self-financed Hank and relied mostly on the hard work of friends and family to complete the film. Hank was filmed between Guilford County and Dan's hometown of Anson County, where the classics The Color Purple and Evil Dead 2 were filmed. On Halloween of 2014, Hank vs. The Undead premiered in Greensboro and eventually was released on DVD in October of 2015 by RetroVision Entertainment. Hank had six theatrical screenings and was accepted into numerous film festivals before spawning the short film pseudo-sequel Hank vs. Dracula. After meeting on the set of Hank vs. The Undead in 2013, Dan and Sammie have gone on to collaborate again and share a partnership in Wreak Havoc Productions, of which Sammie Cassell is Vice President. Sammie also went on to co-star in their short-film Dark Heat, a segment for the feature film anthology, Witching Hour II from Brain Juice Productions. The collaboration between Sammie and Dan continued to Wreak Havoc Productions' next feature film, a documentary entitled Sammie the Comic Book Man. This film is about Sammie's talks to school-aged kids about the wonders of comic books and sparking the creativity and a newly found love of reading. Sammie premiered in December 2016 and was released on DVD in 2018. In October of 2015, Wreak Havoc Productions launched their very own festival event called "The Wreak Havoc Horror Film Festival." The Film Fest is an international festival of shorts and feature films in the horror genre. The first festival was held at the historic Ansonia Theatre in Wadesboro, NC. After a successful first year, the festival expanded and moving to the beautiful Carolina Theatre of Greensboro. The Wreak Havoc Horror Film Fest will continue to its fifth year in 2019. In January 2016, Dan and Sammie premiered a bi-weekly podcast to discuss their favorite movies called, "The Wreak Havoc Film Buffs Podcast." 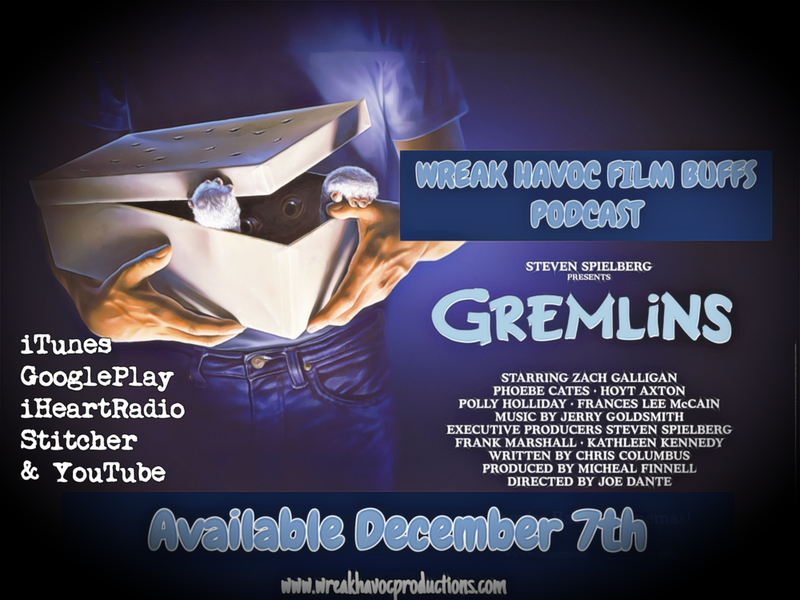 The podcast frequently features guests from the filmmaking community and covers films from all genres and all eras. It's available on numerous platforms including iTunes, Google Play Music, Stitcher and iHeartRadio. In September 2017, Dan launched a new podcast with Jeff Cochran of A Darker World Productions, called The Carolina Haints Podcast. This is a show about ghost stories, folklore tales, unexplained mysteries and the dark history of the Carolinas. Carolina Haints recently concluded its second season and is available on iTunes, GooglePlay and YouTube. Season Three will premiere on September 20th, 2019. Also in September 2017, Wreak Havoc Productions premiered their short film called Midnight Shift, a found footage style horror film about a rural Sheriff's deputy who answers a call he was not prepared for. Midnight Shift is also a collaboration with A Darker World and stars Tom Gore, Joan Schuermeyer and Willie Rayzor. The film is currently enjoying its run through the festival circuit. A sequel entitled Countdown to Midnight and starring Scheuermeyer, Neil Burghard and Michael Hoch was released in March, 2019. Most recently Wreak Havoc Productions has released the true crime documentary Trouble Will Cause about the Lawson Family murders of Christmas Day, 1929. This film focuses on answering the mystery of why Charlie Lawson murdered his family and himself through a psychological exploration. Trouble Will Cause will be screened regionally and is available now on DVD. Wreak Havoc Productions is currently in production on a drama short entitled Sea Salt Wind which is a collaboration with Zack Fox. We’re also in pre-production on an adaptation of the Stephen King horror story Uncle Otto’s Truck - both films are scheduled to be released in 2019. Screening of Sammie the Comic Book Man BUY TICKETS NOW! Wreak Havoc Film Buffs Podcast: 100th Episode LIVE Reading of Smokey and the Bandit! I am so thrilled to launch the official webpage for our next horror short film, Uncle Otto’s Truck which will be going into production this summer! Uncle Otto’s Truck is based on a short story by Stephen King and we have the rights from Mr. King to produce this film! Our plan is to host the World Premiere at the fifth annual Wreak Havoc Horror Film Festival this September. This picture is produced by Wreak Havoc Productions, it’s written and directed by me, and stars Michael Burke and Jennie Stencel. Along with this page we’re launching a fundraising campaign on Indiegogo. Every dime raised will go toward our budget which includes paying cast and crew, locations, costumes, special effects and more. In order to get this film made, we need your help! Please check it out and consider contributing to this production. The Wreak Havoc guys have their very own podcast to discuss movies. Hosted by Sammie Cassell and Dan Sellers, the Wreak Havoc Film Buffs Podcast discusses a wide variety of movies, from Action-Comedies to Dramas. This show is released every other week and frequently features filmmaking guests. 89. Halloween Special - Celebrity Call-In’s Spooky Edition! Brought to you by Wreak Havoc Productions in association with A Darker World, "The Carolina Haints Podcast" is a show about ghost stories, folklore legends, unexplained mysteries and dark history. Filmmakers, submit your horror shorts and feature films to us through FilmFreeway! The submission period concludes on July 31st, 2019. Written and Directed by Zack Fox and Produced by Sammie Cassell & Dan Sellers, Sea Salt Wind is the latest film from Wreak Havoc Productions and is currently in post-production. The film stars Arianna Tysinger, Clancy Miranda Smith and Jeff May. Find the film’s page on IMDB here. A dangerous religious cult is determined to commit mass suicide at the stroke of midnight. Rev. Obadiah, a former member of the cult, has been asked by the feds to assist with last minute negotiations. This found footage-style pseudo sequel finds the exorcist hero of "Midnight Shift" (2017) in a perilous new situation that will test her to her limits. Be sure to "Like" the Facebook page to keep up with all the latest news surrounding not only Midnight Shift but now Countdown to Midnight! Trouble Will Cause, is a true crime documentary from Wreak Havoc Productions about the Lawson Family Murders of Christmas Day, 1929 in Germanton, NC. This film focuses on understanding why Charlie Lawson decided to take his family’s lives, through examination from a psychological perspective. You can find our IMDb page. NPR Interview with Dan Sellers for WFDD’s Eddie Garcia, published September 21st, 2018. Come see Midnight shift at a festival near you! World Premiere at the Wreak Havoc Horror Film Festival (exhibition) - Friday, Sept. 22nd. Sgt. Brown answers the worst call of his career and steps into something for which he is totally unprepared. Told in the found footage POV style, Midnight Shift tells the tale of an exorcism gone awry and the desperate attempt to save a life. Find Midnight Shift on IMDb here. Sammie the Comic Book Man is a feature length documentary brought to you by WREAK HAVOC PRODUCTIONS and ROSE LANE PRODUCTIONS. Sammie follows comic book nerd, Sammie Cassell as he gives a series of presentations to elementary school kids about the wonders of comic books. Through these talks, Sammie is able to engage young readers on a new level and create lasting impacts. Film Festival Screening of Sammie the Comic Book Man - April 14th 15th, 2017 at the Glass Tulip Film Festival in Washington, NC. WINNER of the Best Documentary and Best Full Length Film Awards! Our short film Dark Heat premiered on November 8th, 2015 to audiences at the first annual Market Place Cinema Short Film Social Gala in Winston-Salem, NC. Dark Heat has since screened in numerous film festivals, including the Halloween International Film Festival, the Tryon International Film Festival, the Fright Night Film Festival, the Killuride Film Festival and the Sick Chicks Flicks Film Festival. Starring Ryan Daniel Thompson and Sammie Cassell, this short film is a film noir, horror story about a mysterious package that holds the fate of those who possess it. Set in the mid-40's, Dark Heat is a throwback to "The Twilight Zone" and films like The Maltese Falcon, but with a modern twist and an original score by Ryan Downing and cinematography by Zack Fox. Dark Heat was developed as the opening segment for the feature film anthology Witching Hour II from Brain Juice Productions. Hank vs. The Undead is the first feature film from WREAK HAVOC PRODUCTIONS and tells the tale of a coward, Hank who embarks on a camping trip with his friends but quickly finds he must fight to stay alive as the zombie apocalypse begins. Hank is a horror-comedy that was filmed entirely in North Carolina and has enjoyed a limited theatrical run and a DVD release by RetroVision Entertainment.